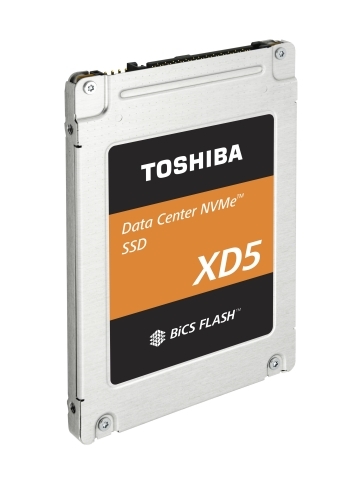 Toshiba Memory Corporation, the world leader in memory solutions, has enhanced the product line of its XD5 Series of data center NVMe™ SSDs for hyper-scale and cloud applications by adding products with a 2.5-inch form factor. Sample shipments will start from the second calendar quarter of 2019. The new PCIe® Gen3 x4 lanes NVMe SSDs use a 7mm height 2.5-inch form factor, which is widely used in various applications including data centers, complementing the current compact M.2 22110 offering. It will be available in three capacities; 960GB, 1,920GB and 3,840GB,delivering up to 2,700MB/s sequential read and up to 895MB/s sequential write performance, within a 7W active power envelope. It is designed for read-intensive applications, such as NoSQL databases, big data analytics and streaming media. The XD5 series SSDs will be displayed at the 2019 Open Compute Project (OCP) Global Summit in San Jose, California, USA from March 14 to 15 in Toshiba Memory America’s A-1 booth. Definition of capacity: Toshiba Memory Corporation defines a gigabyte (GB) as 1,000,000,000 bytes and a terabyte (TB) as 1,000,000,000,000 bytes. A computer operating system, however, reports storage capacity using powers of 2 for the definition of 1GB = 2^30 bytes = 1,073,741,824 bytes, 1TB = 2^40 bytes = 1,099,511,627,776 bytes and therefore shows less storage capacity. Available storage capacity (including examples of various media files) will vary based on file size, formatting, settings, software and operating system, such as Microsoft® Operating System and/or pre-installed software applications, or media content. Actual formatted capacity may vary. Sequential read and sequential write performance under Toshiba Memory Corporation test conditions. The sequential read and write performance mentioned herein may be different from the reference data in the datasheet. *NVMe is a trademark of NVM Express, Inc.
*PCIe is a registered trademark of PCI-SIG.